Although knee and hip surgery is far more common, we do see patients in our clinic just outside Edinburgh who have had ankle surgery. The more common surgical procedures we would see in the clinic are ankle fusions or arthrodesis, ankle ligament reconstructions and ankle arthroplasty or replacements. Ankle fusion or arthrodesis surgery is where the joint surfaces of the ankle are deliberately fused together, it would normally only be done if the patient had significant levels of pain or loss of function and all other treatment approaches have been tried and have been unsuccessful. Ankle ligament reconstruction surgery is carried out in the case of a chronically unstable ankle which has failed to respond to rehabilitation. It normally is carried out after repeated severe ankle sprains have resulted in the ankle ligaments being significantly torn or overstretched. However the majority of the time even significant ankle sprains will respond well to physiotherapy and appropriate rehabilitation. The key here is appropriate rehabilitation as this has consistantly been shown to reduce the risk of recurrant ankle sprains. In this blog post I discuss the third surgical procedure mentioned above. Ankle replacements are significantly less common than knee replacements with less than 900 Total Ankle Replacements (TAR) or Total Ankle Arthroplastys (TAA) being performed in the UK per year. My colleague Paul Bryce had a recent opportunity to observe an ankle replacement being carried out by Mr John McKinley at the Edinburgh Royal Infirmary on one of his patients who had had long standing ankle pain. The surgical theatre was very busy with clinical staff in addition to himself. There was the Surgeon (Mr McKinley), two registrars, a clinical radiologist and theatre nurses. Initially a vertical incision was made at the front of the ankle to expose the joint. This allowed Mr McKinley to point out to Paul the degree of osteoarthritic change, including a large amount of osteophytes (which are bone spurs commonly present in osteoarthritis). A significant amount of these were removed to prepare the area. After using a guide or jig and check X rays to ensure that they were in the correct position. The team then removed part of the tibia in preparation for inserting the metal tibial component. This process was then repeated for the talus in preparation for the metal talar component. Throughout the procedure check X rays were repeatedly taken to ensure that implants were in the correct position before they were secured into position. 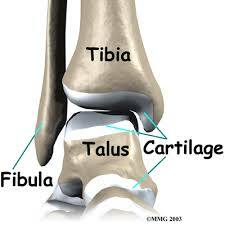 A polyethylene component was then placed between the tibial and talar components and the wound was closed up. The surgeon then performed some final checks to ensure that he was happy with joint and the patient was taken to recovery. Under normal circumstances the patient is not able to weight bear for variable period of time. The sutures are then taken out and they can start to weight bear. Although the precise details will vary from patient to patient, the overarching theme of post op rehabilitation is the same. One of progressively increasing weight bearing, flexibility, strength and function within the limits of pain and any post operative instructions from the surgeon. Whatever your physiotherapy requirements please contact us to discuss your needs. Our physios have good links with local orthopaedic surgeons and a wide range of experience treating musculoskeletal problems from ankle replacements to neck and back pain. We are based in Eskbank just outside Edinburgh, we have no waiting list and have appointments from 8 am to 8 pm. This entry was posted in Conditions we treat and tagged Ankle pain. Bookmark the permalink. ← So you’re going to have knee surgery, what do you need to know?